I’m moved by the organizing that’s happened in the New Economy space, led by people of color, to center racial justice and the work of wealth redistribution and economic sovereignty in all facets of the New Economy. 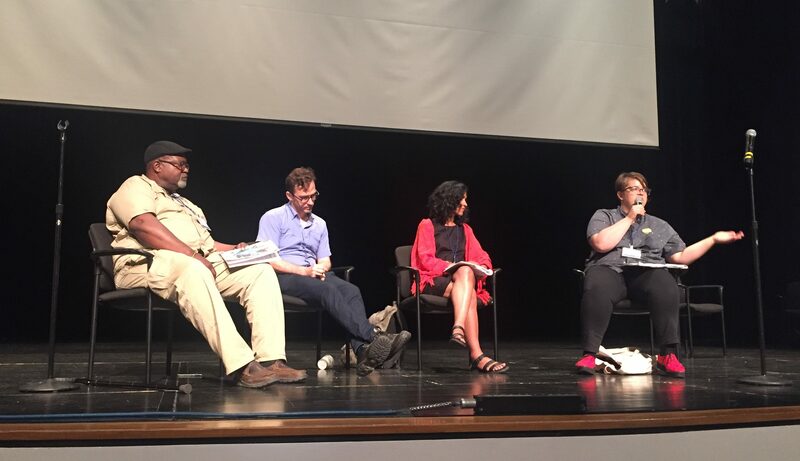 The New Economy Coalition provided buses for folks to go to the local Black Lives Matter protest, and they opened the CommonBound conference with a panel on decolonization, racial justice, and sovereignty. Racial justice was at the center of every single plenary, and many of the panels. You can feel the strong shift–it’s visceral, it’s immediate, it’s powerfull. I was grateful to attend the Reinvest in our Power peer network gathering. The Reinvest in Our Power Network are powerful innovative allies doing grounded earth-shaking economy-shifting work. Regenerative Finance has been growing in partnership with the Reinvest in Our Power Network over the past two years. Organizers that have been instrumental in shaping and guiding us, including Sha Grogan-Brown of Grassroots Global Justice Alliance, Gopal Dayaneni of Movement Generation, and Ed Whitfield and Marnie Thompson of Fund 4 Democratic Communities, are leaders of the network and are doing powerful work to draw down resources and sink divestment capital into community-controlled radically inclusive funds. You should fund them. A highlight of the Reinvest gathering was that communities need funding to resource their economic development work. They need funding for infrastructure and building capacity, and usually they need this funding in the form of gifts and grants. Where is this money going to come from? One answer is through impact investors, like the Regenerative Finance community. If impact investors stop extracting from the communities they believe they’re positively impacting, and instead return profit to community control, then we can fund community capacity. If I want to help a poor black youth-led business in Philadelphia, and they’re running a granola bar company with very low margins, I don’t want to lend them money at 6% if they can’t afford it. They end up taking their profits and sending them to me, a white rich person, instead of paying themselves a living wage. A second answer, highlighted in the powerful workshop on the Ujima Fund in Boston, is investment can be democratized by adding “need” as a component when assessing who gets what level of return. So that poor, working class and middle class investors can receive higher returns, while rich investors can take higher risk and receive lower returns. The panel on their transformation work starts at around the 30 minute mark. A third powerful answer is reparations. Individuals, corporations, and governments paying reparations. What are the ways the harms of slavery shaped this sector? How are the harms of slavery continuing today in this sector? 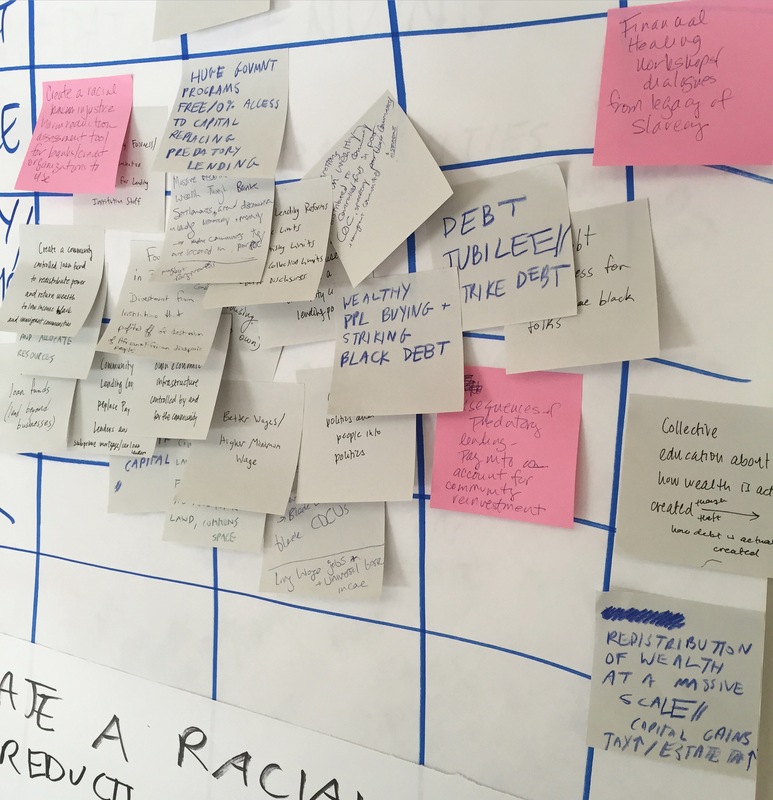 There are lots of photos of beautiful solutions for reparations that emerged, and here’s a snapshot of some of our finance post-its about how to work on the harm of predatory lending. I was particularly surprised and taken by the idea of creating a racial justice harm reduction assessment tool for financial institutions. As we work to shift the narratives in the mainstream economy, and question it’s assumptions, it’s crucial for the new economy field to focus on the leadership of communities of color who are powerfully fighting for justice. I’m grateful I was able to attend Commonbound, and that the conference organizers centered racial justice and indigenous sovereignty. Until next time! Want more like this? Follow us! Regenerative Finance is a decentralized collective of individuals working to shift the economy. We are not a 501(c)3 organization and are not currently accepting donations.